A flow is a visual representation of conditional branch logic that's applied to your contacts once they enter it. Once a contact has entered a flow, they interact directly with its steps. Steps are composed of ActionSets and RuleSets, and determine the length of a flow, which can be as short as a single step or as long as you want. 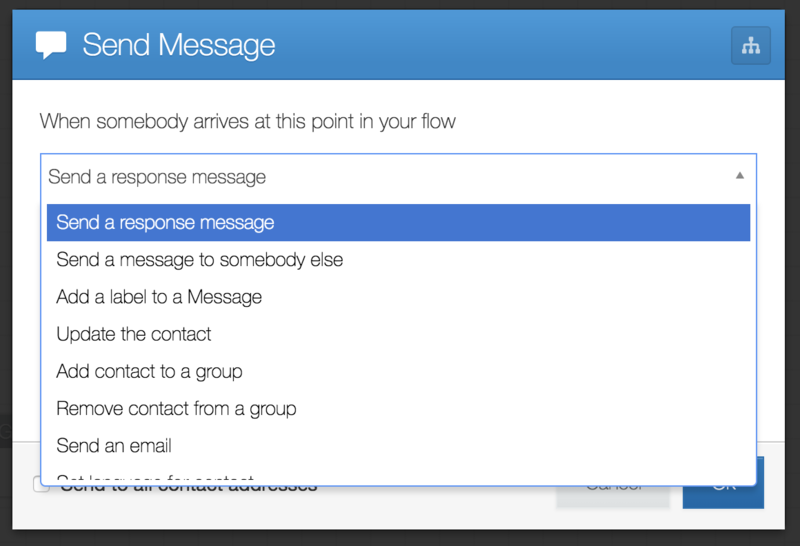 Flows are states that your contacts will enter and exit. Once a contact enters a flow, (s)he becomes an active member of that flow until (s)he exits. Passage through a flow from entrance to exit–and all activity that takes place in between–constitutes a run. Runs and the activity that took place therein are displayed in flow results. Flow runs can be listed and started externally via the Flow Run API endpoint. You place them in a flow using the "Start Flow" button in the flow editor. You can check the 'Restart contacts who have already entered this flow' setting to send to contacts who have already received a message from your flow. Additionally, the 'Interrupt contacts currently active in flows' setting allows you to decide whether your flow will interrupt others. Contacts may only interact with one flow at a time. While a contact is active in a flow, their responses are handled solely by that flow until they exit or the run expires.